Wildlife of the Day ! Whatever the time of year there is always something interesting to see around House of Mark. As I sit here working away on my computer two magnificent stags are grazing less than 300 yards from the window. 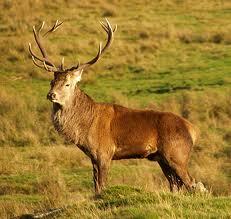 Looking so regal – one can understand why these handsome ‘boys’ are known as the ‘Monarch of the Glen’! (as painted by Sir Edwin Lanseer). As I move into the dining room just outside the window three red squirrels nibble away at the peanuts from the bird feeder http://www.youtube.com/watch?v=rmI0205JvGo, occasionally scampering after each other playfully on the lawn. The Great Spotted Woodpecker ignoring them completely as he pecks away at another feeder. Most guests have also enjoyed watching these antics during breakfast time. Distractions from my work – yes, but I think I am a very lucky person, don’t you?